My research falls into the broad area of "continuum mechanics" or more specifically in the areas of solid mechanics, acoustics, elasticity, elastodynamics, homogenization and micromechanics. Applications of this work lie in metamaterials, industrial composites and biological media such as soft tissue and bone. I am also interested more generally in the mathematical modelling of physical processes and industrial problems, and the application and development of novel mathematical methods. My EPSRC Fellowship "NEMESIS", involves materials modelling projects associated with soft tissue, metamaterials and industrial composites. At the heart of the project though is fundamental, novel applied mathematics. I am the Editor-in-Chief of the international journal Wave Motion. I am also an Associate Editor for the journals Journal of Engineering Mathematics and Quarterly Journal of Mechanics and Applied Mathematics. I lead the Waves In Complex Continua (WICC) group in the School of Mathematics at the University of Manchester. This group was launched in September 2010 with financial support via grants from the Engineering and Physical Sciences Research Council, The Leverhulme Trust, The Royal Society and industry. WICC has strong research ties with Dyson and Thales UK, principally in acoustics and materials technology research. Research presentation to Dyson in 2015. Sir James Dyson in the foreground, looking on with great interest! Here is a talk I recently gave on Hyperelastic Metamaterials at the XAM3 Exeter Acoustic Metamaterials meeting, 16th April 2018. 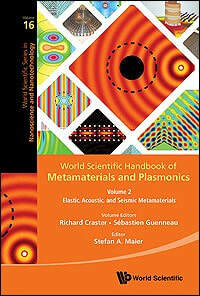 The World Scientific Handbook of Metamaterials and Plasmonics is now published (book image to the left). Chapter 12 of Volume 2 is written by Prof Andrew Norris (Rutgers) and me, focusing on Hyperelastic Cloaking.